In our opinion: To prevent Parliament becoming the preserve of dopey coasters, something needs to be done about pay and MPs. But not what IPSA proposes. To support its contention that MPs are underpaid, IPSA helpfully provided a graph showing the pay of a basic bog-standard MP compared to other senior professionals. Here we see how our MPs are at the bottom of the pile of what IPSA considers their peers. a) MPs' earnings when they hold additional responsibilities in Parliament, from Assistant Whip to Cabinet Minister. b) An example of an MP who earns an extra £250,000 a year doing other work (as a barrister) outside his MP duties. Search the "Register of Members' Financial Interests" and you will find many MPs with paid spare-time hobbies earning them tens and hundreds of thousands of pounds per year. 1) Is being an MP a risky job? According to the Electoral Reform Society, taking results up to the 2010 election, the average parliamentary seat had not changed parties since 1960. Some had not changed since the time of Queen Victoria. While there are casualties at every election (and the occasional massacre e.g. in 2015: Labour in Scotland and the LibDems everywhere), most MPs are in "safe seats" they are unlikely to lose. 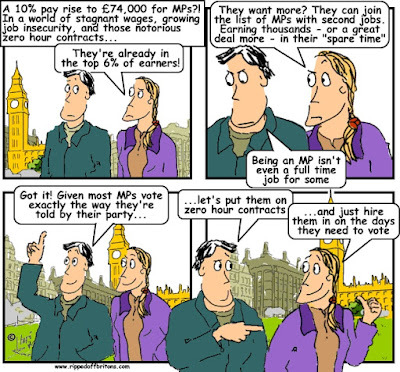 2) Do we need to pay MPs more because of the great responsibility they bear? When it comes to voting, MPs either do what the rest of their party do (63% of the time) or don't turn up (36% of the time). Data from The Public Whip, for the 2010-15 parliament, shows out of all the votes during that parliament, the average MP only voted against his party 1 time in 100. MPs march through the voting lobbies with the predictability of sheep herded by a well trained collie. For those who say "pay peanuts you get monkeys", sheep are even cheaper. "In the Budget 2013 the government announced that it would seek significant further savings from progression pay in the 2013 Spending Round. In the 2013 Spending Round it announced that departments would be putting in place plans to end automatic time-served progression pay in the civil service by 2015 to 2016; also that substantial reform to progression pay would be taken forward or was already under way for teachers, the health service, prisons and police." Will our Parliamentarians take the same medicine they give to the rest of the Public Service? Instead they sit like Trollopian vicars holding out their plates saying they couldn't possibly manage another slice of cake. In the end they will politely force themselve to manage another 7,000. So as not to cause offense. IPSA cherry picked the private sector comparison there, "Directors of companies with a turnover of between £50 and £150m". There are lots of other private sector professional comparisons they could make . Anyway MPs hardly have that level of responsibility. 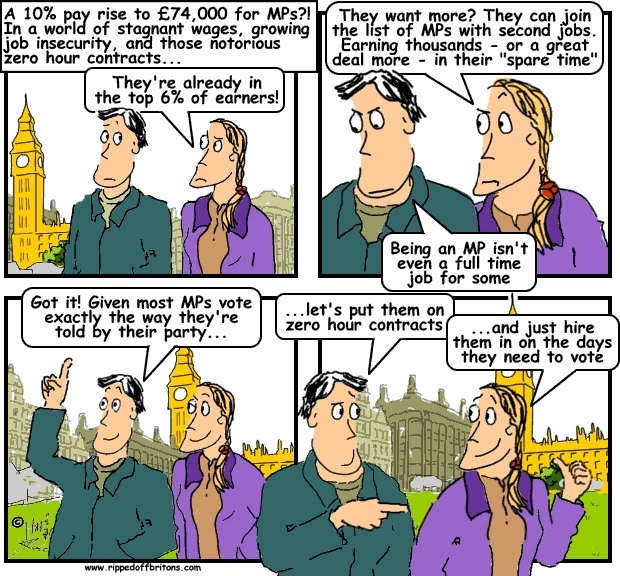 Perhaps some MPs should be paid on performance or keeping their promises maybe. Osborne would be on less than minimum wage. Don't forget the £12K per year for loss of office (redundancy so £30K is tax free) and either 1/40 or 1/50 pension depending on contributions.